1983 Caesars Tahoe Billiard Classic . Oct. 30, 1983 . Lake Tahoe, Nev. This was Earl Strickland at his best. No disagreements, no outbursts, no controversy. Just Earl's pure talent in perfect practice. In the final of the 1983 Caesars Tahoe Billiard Classic, the 22-year-old completely dismantled the mighty Steve Mizerak. Strickland raced through racks and over the Miz for a 9-2 victory - his first major professional title on a big stage. At the time, Tahoe was pool's most coveted title. It was the tournament to win, and Strickland announced his arrival with an undefeated run through the 119-player field. But there were difficulties to be overcome well before he reached the final. In the third-round, Strickland fell behind relatively unknown Sam Alcantar, 4-0. Sitting in the chair as his opponent lined up his next shot, Strickland snapped the shaft of his custom Meucci cue. "I was missing everything I shot at," he said. "I was broke and disgusted, and everything just built up inside me." That swell of desperation appeared to free Strickland from any internal struggle. He found his stroke - after borrowing a cue - and easily advanced, 9-5. A hill-hill victory over Mizerak in the next round and Strickland was dead set on the final. "After beating Steve the first time, I just had that feeling I was going to win the whole tournament," he said. 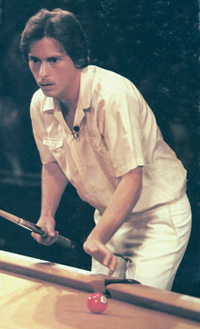 Strickland rolled into the final with wins over Mike Zuglan, Allen Hopkins and finally Howard Vickery in the hot-seat match, where the Pearl made his debut in front of ESPN cameras. These days he's a veteran of the mass media with decades full of TV appearances; but in 1983, the up-and-coming Strickland had to take note of the significance. "In the final match I just said, 'Well, it's TV. You have to behave and play a good match,'" he said. "When I made a lousy shot, I just blew it off and went back to my chair. Took it easy." Easy for him, he was nearly flawless in the final. From the start, Strickland took complete control of the race-to-9, knowing $25,000 and brand new Isuzu Impulse was at stake. The Miz broke dry in the first rack, and Strickland ran out. Two more misses from Mizerak, two more runouts from Earl. Leading 5-1 and hooked on the 2 ball, Strickland jacked up and popped the cue ball over two blockers to pocket the blue ball in the side. The seemingly effortless shot became pool's first highlight on ESPN, just a burgeoning sports network 25 years ago. Strickland won the biggest prize in pool exactly when he needed it. Up 6-2, the young kid began to sense victory was inevitable. He started playing to the crowd - fist pumping after a break-and-run to get on the hill, then a sheepish grin halfway through the title-clinching run. Strickland buried a piece-of-cake final 9 and was immediately surrounded by fans and fellow pros. "I love it!" he screamed. "I love it!" His first big win couldn't have come at a better time for a player with creeping doubts. "I was running out of cash," he said. "And when you know you're playing for your last dime, you start putting more pressure on yourself and you play bad. A lot of things catch up with you. I was talking to myself." Whether due to financial security or renewed self-confidence, Strickland's performance was just the start of the Hall of Fame career that is now ranked among the best in the history of the game. Even a quarter century ago, he knew what to expect - and what he was capable of doing. "I'll tell you right now, too," he said at the Classic, "that unless I die young, I will have more tournament wins than anyone in pool."